Overview: Through structural design and programming, the Bridge becomes a link from the past to the future and a connection is made. By integrating modern suspension bridge design with century – old concrete and steel bridge architecture, the bridge becomes an interesting mix of old and new. The two unique ends of the bridge will be individually programmed for new purposes. The west catacombs will be restored to preserve the rich history of the bridge and its previous streetcar life. 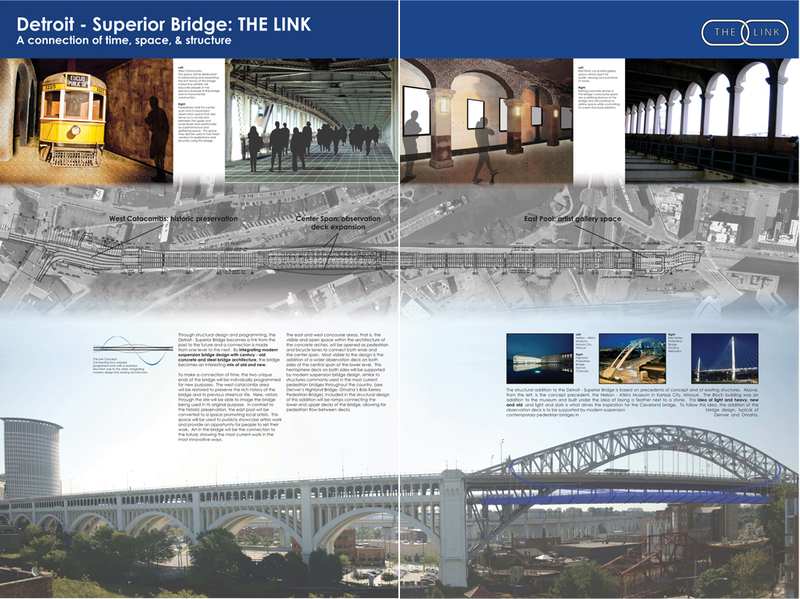 Visitors through the site will be able to image the bridge being used in its original purpose. To contrast the historic preservation, the east pool will become a space promoting local artists to showcase their work. 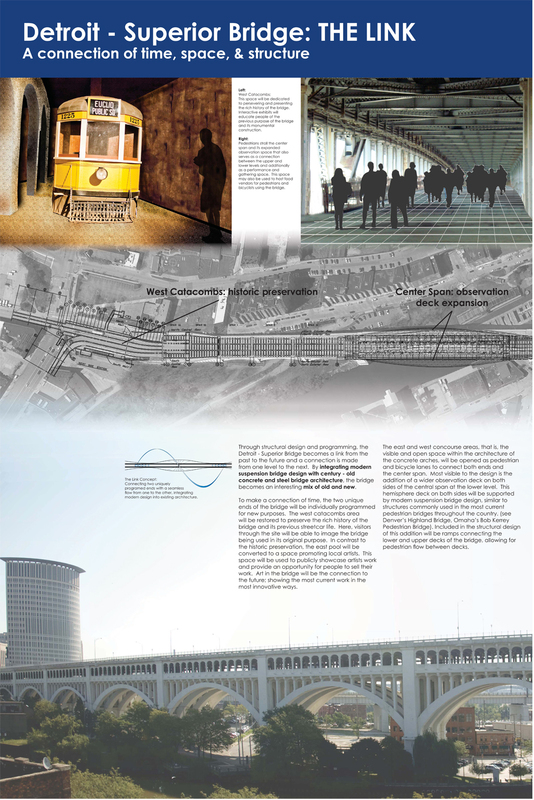 Art in the bridge will be the connection to the future; showing the most current work in the most innovative ways. The east and west concourse areas will be opened as pedestrian and bicycle lanes to connect both ends and the center span. 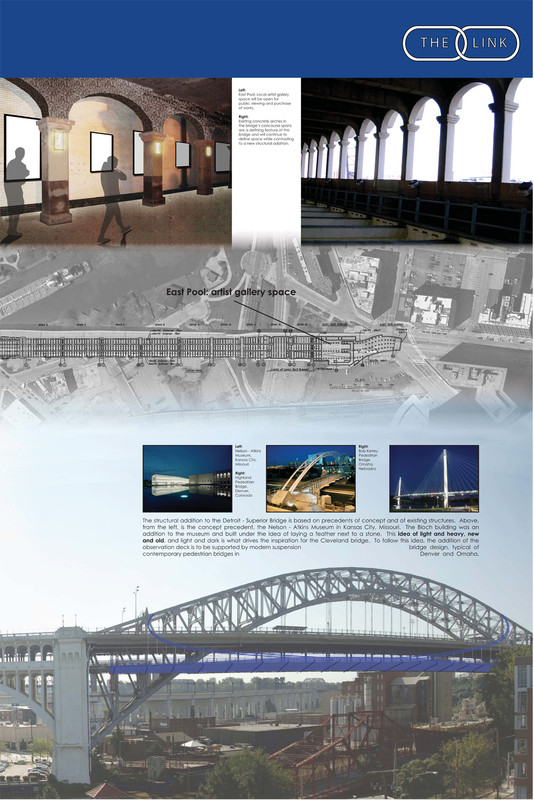 Most visible to the design is the addition of a wider observation deck on both sides of the central span at the lower level. This hemisphere deck on both sides will be supported by modern suspension bridge design. Included in the structural design of this addition will be ramps connecting the lower and upper decks of the bridge, allowing for pedestrian flow between decks.